HOUSTON, TX: September 16, 2009 Houston-based Trimira™ LLC has introduced the Identafi™ 3000 ultra, an upgraded version of the small, cordless, handheld oral cancer screening device they introduced in March 2009. The ultra features enhancements such as nickel-plating, double the auto-fluorescent power, and both hardware and software upgrades. 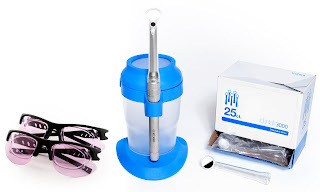 The device uses a three-wavelength optical illumination and visualization system to allow dental professionals to catch early cancers not visible to the naked eye. The Identafi 3000 ultra features the same proprietary, patented multi-spectral light wavelengths as the popular Identafi 3000. A study published in the May 2009 issue of Cancer Prevention Research found that the excitation wavelength delivered by the Identafi 3000 (and Identafi 3000 ultra) is optimal for discriminating between neoplastic and non-neoplastic lesions. New diodes deliver twice the auto-fluorescent power to further improve visualization. The Identafi 3000 ultra uses three different wavelengths of light to excite oral tissue in distinct and unique ways. Biochemical changes can be observed with fluorescence, while morphological changes can be observed with reflectance. This multiple wavelength technology identifies abnormal tissue with more accuracy than a single color wavelength. Nickel plating has been added to the Identafi 3000 ultra to boost electrical conductivity, improve durability, and provide a smoother feel. Trimira has also made hardware and software upgrades to maximize the device’s performance. The Identafi 3000 ultra is supported by a national team of trained sales representatives and is available through most major U.S. dental dealers. TRIMIRA LLC is a subsidiary of Remicalm LLC, a privately held medical diagnostic and imaging device company. Other subsidiaries are working on screening and diagnostic devices for skin, cervical, gastrointestinal, and bladder cancers. Remicalm's core technologies are based on high-speed, high-resolution capabilities from its patented optical processing technology platforms and include the ability to read metabolic and physiologic differences in diseased and healthy tissue in the human body. For more information, go to www.trimira.net or call 888-984-9525.